It’s a brand new year, and I’m very excited! Are you? Are you reviewing last year’s goals and accomplishments? Taking note of who you’ve become in the process of pursuing your dreams? Setting your sights on even more growth and achievement in 2017? When you look at the key areas of your life – your finances, relationships, health, career and personal/spiritual growth – can you see how far you’ve come in the past twelve months? Or when you think back to January 2016, do you realize that you’re almost exactly where you were twelve months ago? As we’ve heard, doing the same thing over and over and expecting different results is the definition of insanity! Going on that strict celery and mineral water diet to shed unwanted pounds was a bust last year. So what makes you think you’ll have any more success with that approach this year? Or you’ve been putting in scads of overtime, hoping your boss will notice you for promotion, only to be skipped over time after time. Do you really think that even more hours this year will get you where you want to go? Or perhaps you tried to build your retirement fund by throwing more money at your 401(k), only to see high fees and the volatility of the market sabotage your efforts. For a better alternative, a guaranteed way to build a retirement nest-egg that’s never had a losing year in more than 160 years, request your free Bank On Yourself Analysis here now, if you haven’t already. You can know the bottom-line numbers and results you could get if you added the Bank On Yourself method to your financial plan before you decide if it makes sense to do it. Whether it’s a weight loss plan or career plan or a retirement plan, if it isn’t working, isn’t it time to do something different? So who’s in charge of your calendar? Our lives are full of busy-ness, some that we create ourselves and some that others put on us. But if we truly want changes in certain areas, we need to put those changes at the top of our To-Do lists. Check it out and consider: Where are you spending your time? If you don’t have a good amount of your waking hours dedicated to the things that you’ve categorized as Important, expect to find 2017 a sad repeat of last year! It’s important to figure out exactly what the problem is. But once you understand the issue, your attention has to be on solutions, not obstacles. For example, you may want to build a healthy rainy day fund – which, to be a really decent safety net, should be at least two years of your expenses, no matter what celebrity financial advisors tell you. But when you look at your current income and expenses, stashing away money in savings may seem impossible. Rather than staying stuck on the difficulty of putting money aside, try this question: “If I could find money to put into savings every month, how might I find it?” Then sit down with paper and pen to brainstorm all the different ways you might come up with money to save each month. Some of your ideas may seem pretty lame – but write them down anyway. It’s like priming a pump until you get down to the good ideas. By focusing on solutions, not just difficulties, you’re bound to land on some solid ideas you can implement! You want to pay down your debt but you also want to have fun in life. You want to lose weight but you really appreciate great food. You want to advance in your career but you want to spend time with your young family. If you don’t reconcile your goals and your values, you’ll find yourself spinning in circles! It’s as simple as sitting down to determine what’s really important to you and is in keeping with your values. As you do this, you might notice a conflict between certain values or goals. Once you’re aware of the conflict, the trick is to work out a creative compromise. For example, love food but not being overweight? In French Women Don’t Get Fat, the author explains how the French indulge themselves and then balance out each indulgence with a little more exercise or a little less eating the following day. For some goals, the compromise is timing. You may choose to give up golf or hosting holiday get-togethers while building your business. You might delay that promotion requiring a 50-hour-per-week commitment until the kids are in school. Whatever the compromise, it doesn’t matter if your boss or mother-in-law or neighbors think it makes sense. It has to feel good and right to you. If you’ve been stuck in any area of your life, repeating the same old same old ad nauseam, I encourage you to see if the tips above can help knock you out of your rut! 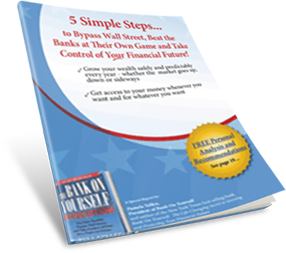 And if this is the year you’re ready to take back control of your money and finances, I hope you’ll take the first step by requesting a FREE, no-obligation Analysis and find out how adding the Bank On Yourself method can help you reach your financial goals and dreams without taking any unnecessary risk.